Digitalis or foxglove are clump forming perennials. 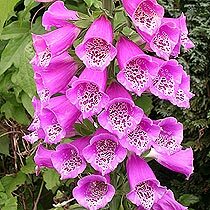 They have large green leaves and on tall stems they have tubular flowers during the summer months, it is a known fact that the foxglove flowers fit perfectly on the tip of your finger like a thimble. If growing from seed the first year is just foliage and then the second year they will throw up a tall flower spike and flowers. Other than that they are easy to grow and like sun or part shade a nice healthy soil. We suggest that once they have finished flowering you trim off the old stems.